Iran says it flew a surveillance drone over an American aircraft carrier in the Gulf and took photographs of it. Iran flew a surveillance drone over an American aircraft carrier in the Persian Gulf and took "precise" photographs of it as part of an ongoing naval drill, state media reported Friday, according to The Associated Press (AP). The U.S. Navy said an unarmed Iranian drone flew near a French and American carrier earlier this month, but could not confirm it was the same incident. The Navy said it did not open fire as the drone was unarmed and not threatening the ship's safety, but the incident again highlighted that tensions remain between America and Iran in Gulf waters. AP could not independently verify the footage, published by Iranian state television and the semi-official Fars news agency, which has close ties to the Revolutionary Guard. Adm. Habibollah Sayyari, the commander of Iran's navy, called the drone overflight "a sign of bravery". It "allowed our men to go so close to the warship and shoot such a beautiful and accurate footage of the combat units of the foreign forces," he told state television, according to AP. Cmdr. 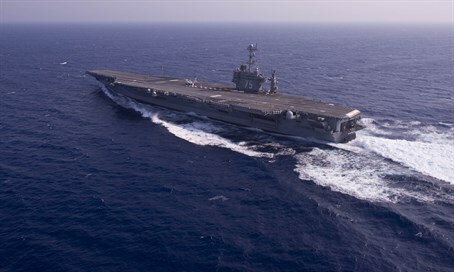 Kevin Stephens, a spokesman for the U.S. Navy's 5th Fleet based in Bahrain, told AP an unarmed Iranian drone flew near the French aircraft carrier Charles de Gaulle and "directly over" the USS Harry S. Truman on January 12 as the vessels were in international waters in the Persian Gulf. He said the Navy launched a helicopter that determined the drone wasn't armed and "posed no danger to the ship" as the carrier wasn't conducting flight operations at the time. Stephens called the drone's flight "abnormal and unprofessional." He added that the Navy was "not in a position to verify the authenticity of the video as there are countless examples of similar footage to be found on the Internet." The incident would not be the first run in between Iran and the United States in the Gulf. Earlier this month, Washington said Iran launched rockets near an American aircraft carrier in the Persian Gulf. While Iran initially denied doing so, footage was later released that proved it had indeed fired on the American carrier. Days later, Iranian forces captured 10 Navy sailors who entered Iranian territorial waters near Farsi Island. The sailors were released within a day, but Iranian state media aired footage of the sailors' capture, angering U.S. politicians. Defense Secretary Ashton Carter has said that a navigational error caused the American crews to accidentally enter Iranian waters. Iran, which frequently conducts missile tests and maneuvers to underline its military muscle, has repeatedly threatened to close the Strait of Hormuz to oil tanker traffic should it be attacked.